Odor Removal Done Right The First Time! Any Odor – Every Time! We’re Here To Help! Let Us Stomp The Stink! The Stink Stomper of Northern California’s Odor Removal System completely eliminates funky odors at their source. We never use air fresheners of masking agents in our odor removal process, we offer a Complete Odor Removal & Indoor Air Quality Reset for your home or business. Safe: All our odor removal products are free of harsh chemicals and are safe for use around people and pets. Effective: You’ll love the fresh, clean, back to neutral smell our process leaves behind. Powerful: Our products don’t mask odors. Instead, they penetrate right to the source of the odor and destroy it at the molecular level. Cost Effective: You’ll be surprised at how affordable it is to eliminate unpleasant odors—naturally! Fast: In about 24 hours, the treated areas are ready for normal use! If you’re ready to get started or learn more, give us a call or fill out our online form today to schedule a free odor remediation inspection and quote. 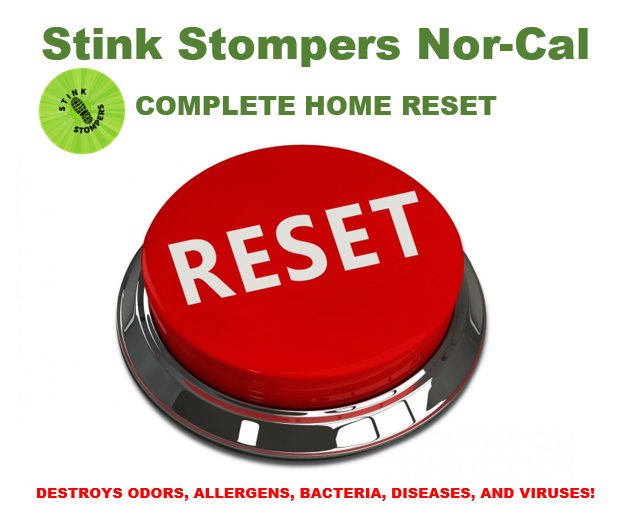 If you have odors in your home that fragrances or houshold deodorizers just won't get rid of, it's time to call Stink Stompers. We don't cover up the odor - we eliminate it - every time - Guaranteed! We can remove odors from Smoke, Tobacco, Marijuana Pets, Mildew, Cooking and more. Fast, Safe, Effective & Guaranteed! Any Odor Removed in Your Home Every Time! 100% Guaranteed! We provide odor removal vendor service for auto dealerships and private party vehicles of all kinds. We remove odors from tobacco, cigar, marijuana, vapes, pet, mildew, and more that even the best detailers leave behind. We can permanently eliminate any odor every time in any vehicle, RV or boat. 100% Guaranteed! Most vehicles can be completely deodorized in as little as 1 hour. Our service is very affordable and 100% Guaranteed. How can you go wrong? We quickly and effeciently remove odors left behind by guests including body odors, moisture, food odors, tobacco and even marijuana and we never use ozone or toxic, temporary fragrances or other cover-ups. All Odors Gone - Guaranteed! Stink Stompers is your solution for deodorizing and sanitation. No odors and fresh and clean for your next guest. 100% Guaranteed. No odor is too strong or funk to nasty for us to ELIMINATE. Odor remediation is an essential service for nursing homes, rehab centers and private homes of people who are under convalescent care. Our epa approved process sanitizes, disinfects and removes every odor or every kind, everytime - Guaranteed! Our Sanitizing & Deodorizing System uses a technologically advanced process to sanitize and deodorize areas without the need for toxic chemicals, fragrances or manual wiping and rinsing. We sanitize a multitude of germs, allergens, odors and indoor contaminants. Are You A Real Estate Professional? Check Out What We Can Do For You!